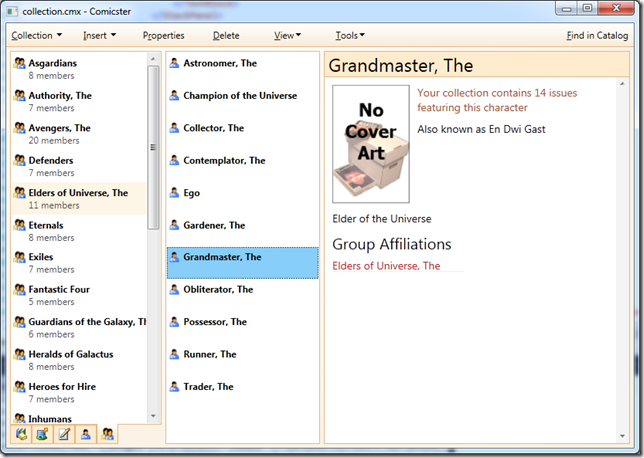 I’ve just published the first plug-in tool for Comicster 4. This will merge storylines and autographs from the CMX file you originally converted from the previous version of Comicster. 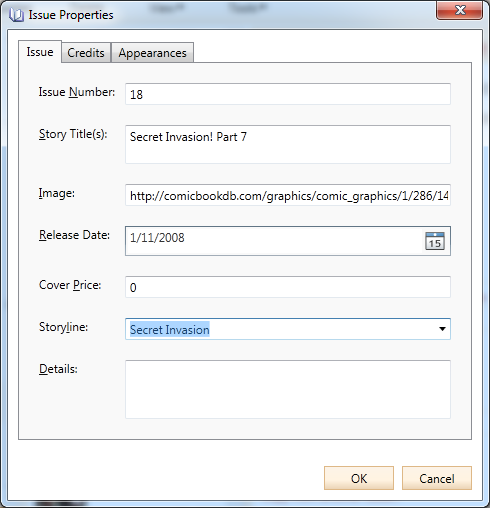 Note that it finds storylines and issues based on the internal IDs, so if you’ve removed an issue and added it back in since you opened the CMX file originally, this merge tool won’t find it. 1. 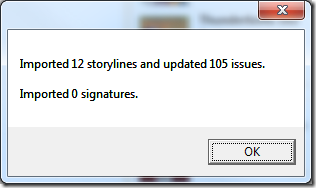 Run Comicster and make sure it updates to the very latest version. 2. Download the zip file from here and extract the two DLLs inside to your “Comicster” folder under “My Documents”. One of them (Comicster.Data.dll) is probably already in there, but it’s safe to overwrite. This is meant to be a temporary thing so I haven’t put any effort into a nice user interface for it. Give it a whirl and let me know how it goes. I’ll update the tool later when I introduce a “Printing” field for issues, and blog about it here. A feature that was in the previous version that I’d forgotten about in v4 (thanks for the reminder, John) was the ability to record whether a creator has signed an issue. That’s now available in 4.0.0.11. Now, if you’ve already imported your old CMX file and you’re missing some features that I’ve added in the past few versions (like autographs or storylines), let me know in the comments on this post if you’d like to see a plug-in tool to import those from your original file. With the latest release of Halfwit (version 2.0.0.36) I’ve changed the way the “Reply” and “Reply to All” actions work. Having two different behaviours depending on the shift key (no pun intended, Brendan) was a bit weird, so I’ve rolled the two up in what I hope is an intuitive combination. That means you can just start typing if you only want to reply to the original tweeter, and the other usernames will get replaced. 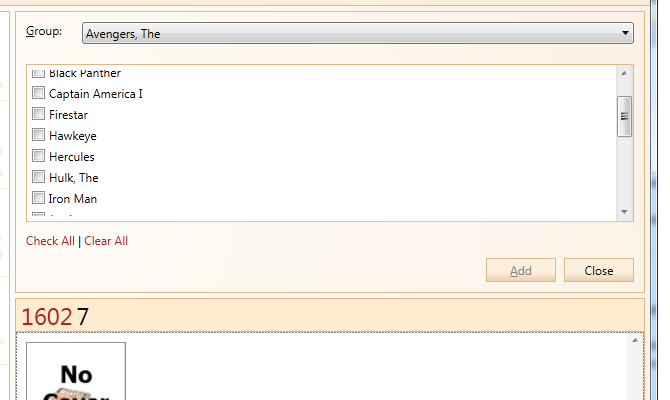 If you want to reply to all, you can press Home or End on your keyboard to deselect the text and then type your reply. I think this is a nicer balance between “Reply” and “Reply to All”. It’ll take some getting used to though. Let me know what you think. You can easily add a new storyline by simply typing its name into that field – it’ll get created and show up in the list alongside all the others in your collection. 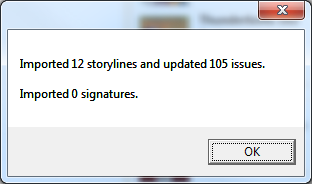 Just like in the previous version I’m deliberately limiting it to one storyline per issue. I don’t think that’ll be too severe a limitation – certainly it has never bothered me. For those of you with lots of crossover events in your old .CMX file, you’ll find an updated CMX file plug-in on for download on the Bitbucket site. One reason both Mad Props and Matt Hamilton.NET have been a bit quiet lately is that Sal and I have been in the US and Canada so that I could attend the 2011 MVP Global Summit at Microsoft. We spent six nights in Vancouver before the summit, which aptly demonstrated why that city is often voted the “most liveable city” in the world. In fact, it received the award for 2011 while we were there. Despite unseasonably cold weather (one day only managed to get as high as -2°C) we thoroughly enjoyed our stay. Vancouver served up some of the most amazing meals I’ve ever had, including a five-course monster at Tojo’s, the restaurant owned and run by the inventor of the “California Roll”. No Japanese food is going to taste the same after that. Once our stay in Vancouver was over, we took a coach to Seattle and then a bus out to Bellevue where we’d be staying for the next five nights during the summit. Bellevue is home to a large shopping mall called Bellevue Square, which is where Sal would find herself for the next four days while I visited Microsoft campus. The summit itself was somewhat mind-blowing. The point of the summit, as I understand it, is to give MVPs a chance to meet with the product teams and influence the next version of the products in which they specialise. My MVP area of expertise is “client application development” so I got to meet the WPF team and sit in a day and a half of sessions focusing on WPF. It was fascinating to sit in a room full of people who are truly experts in WPF, whose complaints and criticisms stem from a deep understanding of the framework and from trying to do some really advanced things. For this little line-of-business application developer, it was quite humbling. Better than the content, though, was the “networking” that came along with so many passionate geeks being in the same place at the same time. Half a world away from home, I met a whole bunch of fellow Aussie developers whom I had only conversed with online until now. On top of that, I got to meet some of my idols from Microsoft – people like Glenn Block, Jon Galloway, Scott Hanselman, Pete Brown, Rob Relyea, Phil Haack, Damian Edwards and the red-polo himself, Scott Guthrie. Then there were the other MVPs who I interact with via Twitter that I finally got to meet in person – Laurent Bugnion, Rob Eisenberg, Richard Campbell, John Sheehan – the list goes on and on (and if I’ve left you out, it wasn’t deliberate – I apologise)! Following the summit, Sal and I shifted to Seattle proper where we spent five nights at Inn at the Market, right in the heart of the city. Unfortunately I’d picked up a rather nasty chest infection (as did several other summit attendees, apparently) so we didn’t get to do as many touristy things in Seattle as we would have liked. It was still a fun week, though, with lots of good food and shopping to be had. Edit: Ooh! I forgot to mention that we got to go to Emerald City Comicon while we were in Seattle! We went to a Guild discussion panel with Felicia Day, Will Wheaton and Amy Okuda, and I got a personally-signed comic from Kurt Busiek! We had no idea that ECCC was on while we were there – just a lucky accident. Overall the 2.5 weeks we were away made for what might have been our best vacation yet. If I’m re-awarded as an MVP again this year, I can’t wait to go back next year and reconnect with everybody! Last night I decided to try something in Comicster that ended up working really well, and will make it to the next release. 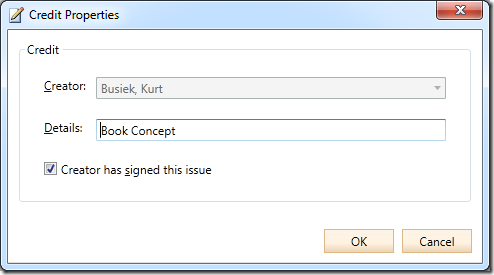 This new approach lets you add from multiple groups, or copy from multiple issues, without having to go in and out of a dialog box. It’s a lot slicker and feels much more “tightly integrated” with the rest of the interface. 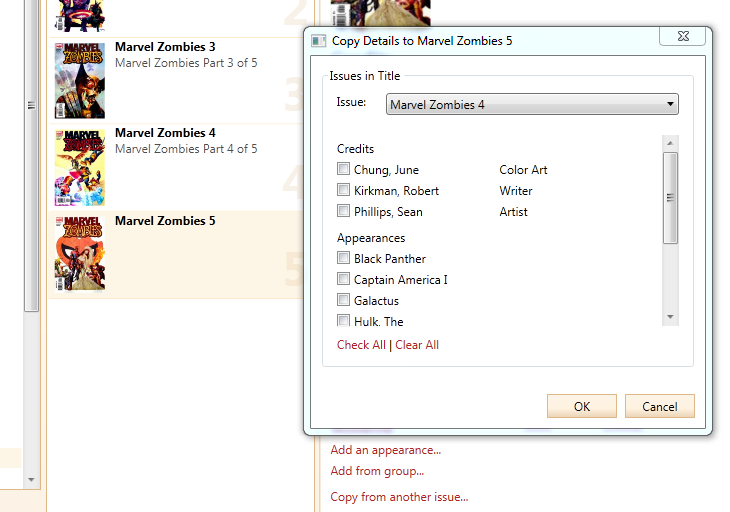 Look for this in the next release of Comicster. The next major feature will be the addition of “storylines” which can be defined centrally and shared across issues (great for major events or crossovers). Don’t know how long that one will take (especially since I’ll be overseas for three weeks) but I’m looking forward to having a crack at it! I’ve just published Comicster 4.0.0.6, which adds the ability to copy the credits and appearances from another issue in the same title. Here’s a screenshot! 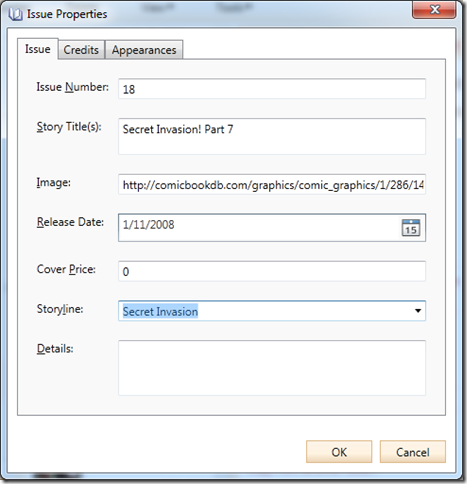 Comicster 1.x had this feature too, but it was a two step process – you had to copy the credits and appearances separately. I’ve combined the two into one handy dialog in this new version! I’ve just published version 4.0.0.3 of Comicster, which adds the final piece of the “group” puzzle: the ability to add appearances to an issue from a previously defined group. Here’s a screenshot! You know the drill. Comicster 4 is still very much a work in progress, but it’s at least as feature-rich as the old version now – just a few finishing touches and I’ll be happy to call it “out of beta”. As always, if you can think of things you’d like to see, or things that need fixing, log an issue over on BitBucket. 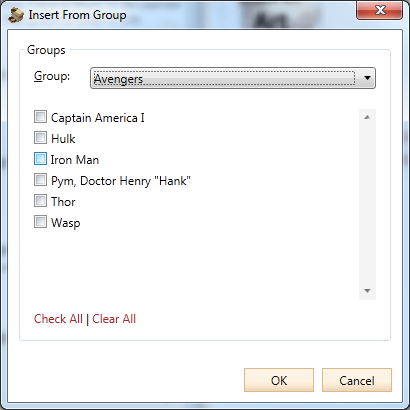 Comicster 4.0.0.2 is now available, with limited support for groups/teams. 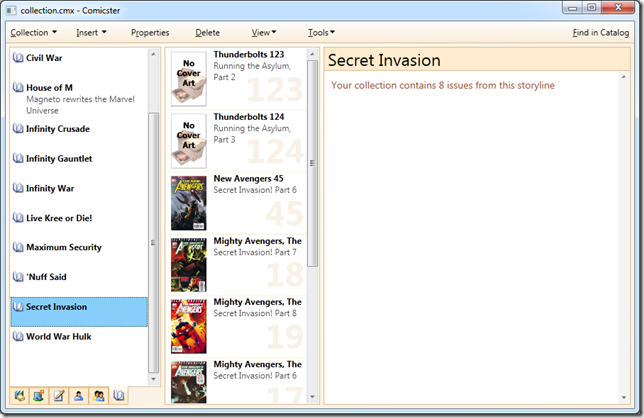 Comicster will automatically update when you next launch it. 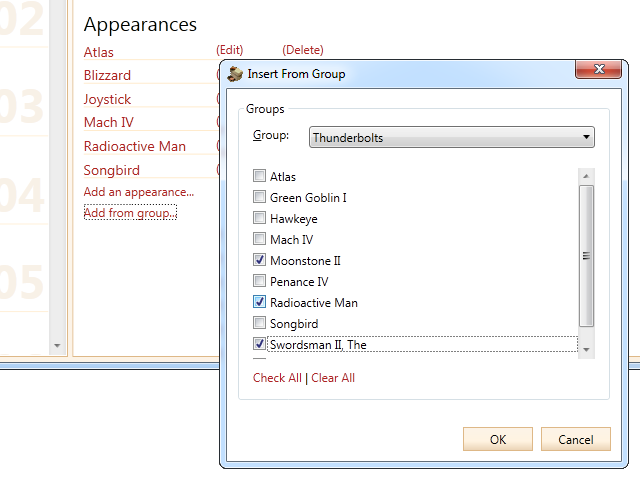 The idea is that you can define your own groups and add characters to them, and then eventually it’ll be easy to add appearances to an issue by choosing a group and then selecting which members of that group appeared. Pro-tip: Double-clicking on a character in this view (in the middle column) will jump you straight to that character’s entry in the “characters” view, so you can view the issues they appeared in etc. 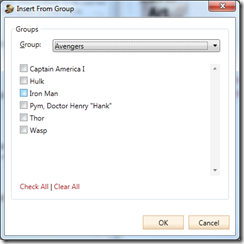 The Comicster.IO.Cmx plug-in, which allows you to open your Comicster 1.x collection, has been updated and will now pull your existing groups in. Grab the latest version of the plug-in and install it by following the instructions in the previous post. Ok, there’s a bit of demand out there for this plug-in, so I’ve made it available via BitBucket until such time as I can get an “official” plug-in page up on the Comicster web site. 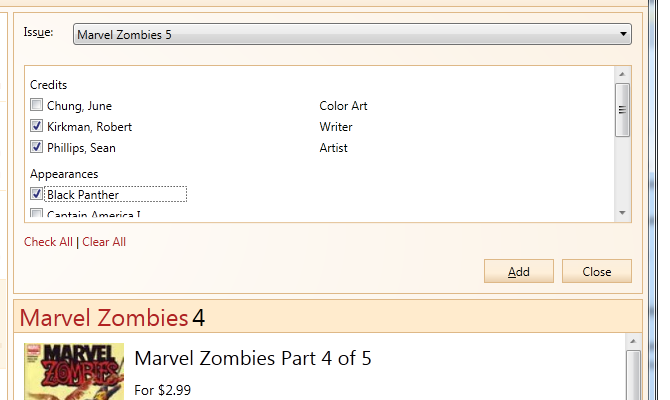 The Comicster.IO.Cmx plug-in allows Comicster 4 to open Comicster 1.x (I guess technically it’s 2.x, but whatever) files. 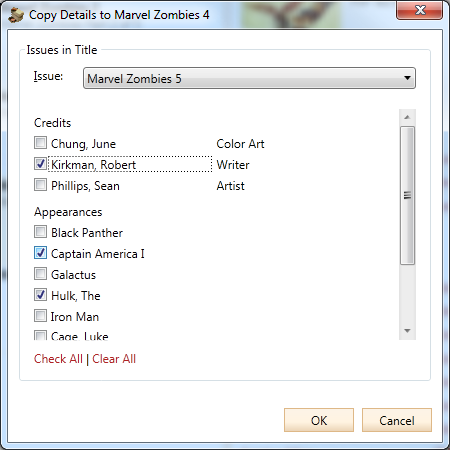 It doesn’t support saving, so you’ll need to save your files in Comicster 4’s new .cmxx file format. That’s it! 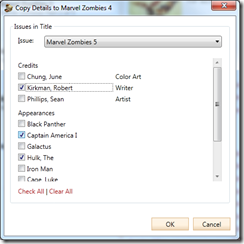 Comicster will look for plug-ins in a folder called “Comicster” under your “My Documents” folder. The Comicster.IO.Cmx plug-in contains two files – one is the plug-in itself, and the other is a “helper” file that tells the plug-in how to load .cmx files. 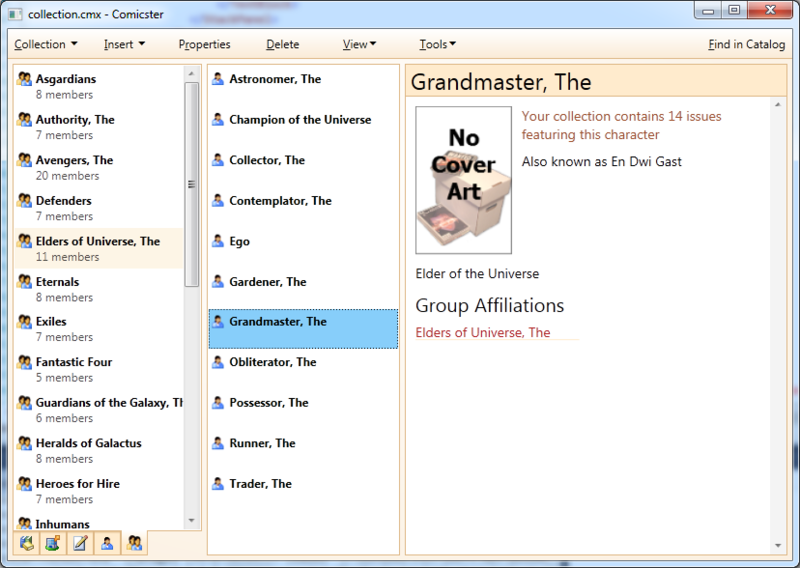 In a future version I think I’ll probably make Comicster look in a special “Comicster\Extensions” subfolder rather than just “Comicster” (since you’ll probably want to keep your collection files in there and we don’t want that folder getting too full), so keep an eye out for that change. I’ll make sure I announce it here.